There’s been talk of a city-wide bike rental scheme for a long time, and it’s finally here. Introducing Valenbisi. We lived in Berlin, where the Deutsche Bahn (the railway company) operated a very popular bike rental service. You’d just type the bike’s serial number into your cell phone, hop on, then park it when done. Very practical, and we’ve been aching for Valencia for implement such a system. So Valenbisi, run by the city government, is very welcome. 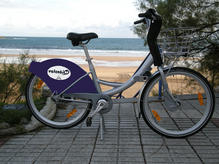 Bikes are the best way to get around Valencia, bar none, and we think that the service is going to be extremely popular. The bikes look sturdy and strong. The prices are reasonable — €10 for a 7-day subscription — the first 30 minutes are always free, then it’s €0,50 for the next 30 mins and €3,00 for every additional hour. Not a single station anywhere in the historic center? Ruzafa? The train station? There must be a reason, but tourist friendly, it’s not. Great for students of the U of Valencia, and perhaps that’s the true target market. (Though if you’re targeting hip college students, this might not be the best image to put on your website). Update: The consensus in the comments is that the bikes will be better distributed throughout the city in the future, and there’s a link for future locations can be found there. Valenbisi should put this information on its website. 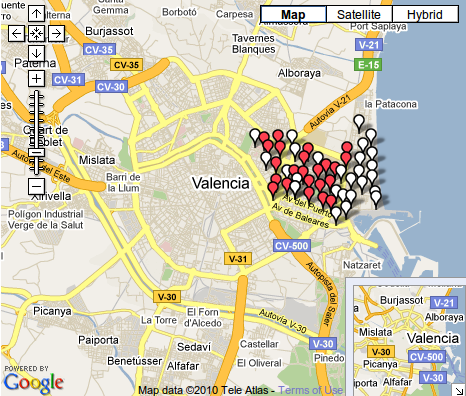 Anyway — the addition of 2750 bikes to Valencia’s streets is extremely welcome. We need more bikers on the streets, which will lead to better bike paths and more respect from drivers. We’d love some comments from anyone who’s used the service, in regards to the quality of the bikes and the ease of rental. I agree with your point about the dispersal of the stations, but I think the map on their site is out-of-date. Some of the white pin stations are already in place, and the map in the stations indicates that there are a lot more stations near the center. This is phase 1 of 2 phases of the roll-out, apparently. I aplaude the initiative but I don’t consider 10€ for 7-day (although is better than nothing) cheap. That makes 40 to 50€ per week and that’s way more than a metro/bus card. I just read on their web-site that they also have a long-term card for 18€, that’s much better!! Service is focused on Valencia’s inhabitants, that’s why the “tourist fee” is 10€ and requires a provisional charge into your credit card. If you live here, the 18€ card is your choice. Last Monday, I rode one of the bikes and it was good enough. The brakes need to be better and it’s better to check the seat first, but I agree with you, this is going to be an extremely popular service. The map is updated, on their website you can check the exact number of bikes on each station. White ones are built stations, but without bikes… perhaps in a few days. During the summer the system is going to be extended to the centre: http://maps.google.es/maps/ms?ie=UTF8&hl=ca&msa=0&msid=108046025429919070703.000486769f9ed2e895d30&ll=39.470523,-0.361519&spn=0.064799,0.110378&t=h&z=13 And by 2011, all the city must be covered. Don´t worry about distribution. Our tax dollars were already disbursed based on the overwhelming *minority* of voices that rallied for this debacle (along with the wasted PlanE bike lane millions – and I still nearly get run down by jackass, law-breaking cyclists on the sidewalks multiple times daily). And, the bikes will end up in all corners of Valencia anyway, once the thieves, vandals and other irresponsible “joyriders” get their hands on them, just like they have in Barcelona and every other city that´s implemented this money hemorrhaging system. You guys really have a good blog. It´s just that you fall on the provably failed side of every social, economic and political issue facing Valencia today. Stick to the sight-seeing and leave the commentary to the other talking heads. Bike lanes are necessary in Valencia, this is not Amsterdam, so we can not put 2750 bikes directly on the asfalt (Can you imagine riding inside Colón street? Dangerous, crazy). In a few years, bikers will show more respect, drivers will be careful, and streets will be more quiet. The bike service is “free”, I maen, it is payed on advertisement and subscription, and that includes vandalization, fires and everything. If JCDecaux or ClearChannel wants to provide this service in many cities, with no charge for the local council, I’m sure that they don’t loose any money. I noticed these bikes immediately after arriving in Valencia a few days ago. So far I have not found any way to use a credit or debit card at any Valenbisi kiosk, nor is any intelligible info posted on Valenbisi´s website about how to pay for a one week pass. As noted in an earlier comment, this may be because the English language version of the website is in abominably bad English. Hopefully all of these kinks will get smoothed out as the rollout proceeds, but clearly Valencia is not interested in serving the entire city with these bikes, nor is it straining itself to make the system user-friendly for tourists. I decided to leave my folding bike home because I didn´t want to deal with extra luggage issues. That was a very bad decision that I won´t make the next time I visit Spain. I have never seen a more bike-friendly city than Valencia. Barcelona is also amazingly bike-friendly.